There are some sapphires that have instilled such a mark on the world that they have been names and are known in every corner of the globe. Precious gemstones are rare and valuable, and each uniquely beautiful. However, there are some that enter the status of legendary. These special wonders are usually known by a name and are coveted by collectors and museums alike. They are set apart from the rest by their sheer size, their unmatched beauty, and their stellar provenance. 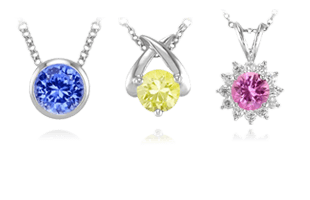 These are the sapphires that have established that presence in the world. 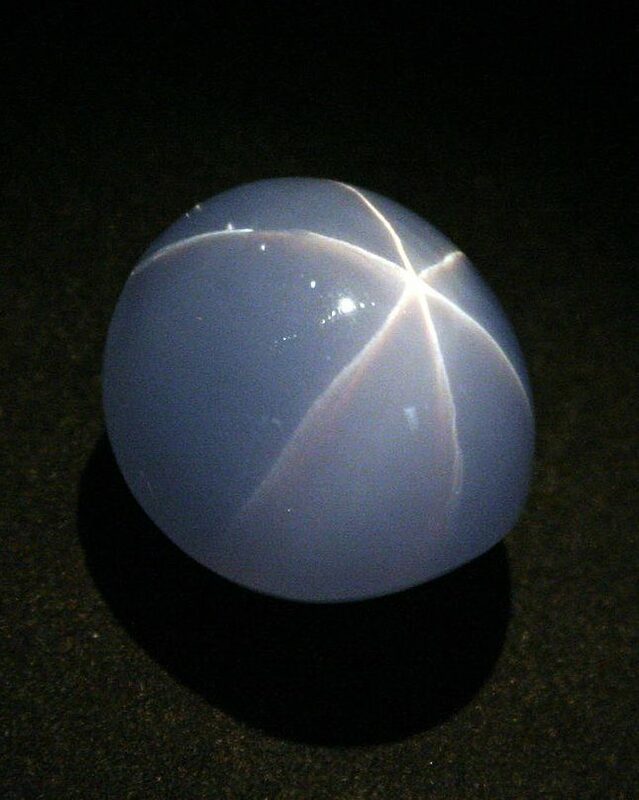 The recently discovered Star of Adam light blue star sapphire. Photo credit: BBC News. Only discovered as of 2016, this giant blue star sapphire has blown the previous largest sapphires out of the water. Gemologists in Sri Lanka have certified that the gem weighs 1404.49 carats and is valued up to $300 million. The Star of Adam is privately owned and was discovered in the Ratnapura region of Sri Lanka, known as the Land of Gems for the sheer volume of gem-quality sapphires that have come from that area. Discovered in Queensland, Australia in the 1930s, the stone that would become the Black Star of Queensland served as a doorstop for over a decade before being discovered by a sharp-eyed lapidary , Harry Kazanjian. Kazanjian cut and polished a masterpiece, bringing the Black Star of Queensland in at an astounding 733 carats. The Black Star of Queensland star sapphire on display. 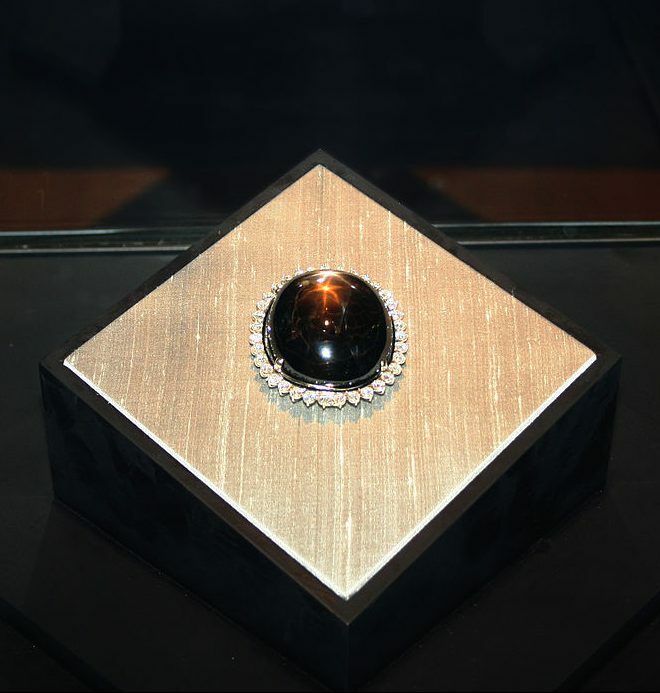 The gem proceeded to tour museums and adorn celebrities before coming to rest at the center of a tumultuous legal battle between a man who’d seen the Black Star on display at the Smithsonian as a boy and dreamt of it as his heart’s desire thereafter, and the woman whom he apparently conned into buying it for him. Luckily, justice prevailed for the Black Star of Queensland and its owner, and the stone’s disposition is no longer in doubt. The Star of Bombay violet-blue star sapphire. Discovered in Sri Lanka in the early 1930s, the Star of Bombay is a beautifully clear violet-blue star sapphire with lovely asterism , weighing in at 182 carats. It has a storied past, being set in a platinum ring by jewelers on Park Avenue in New York City where it was selected by actor Douglas Fairbanks, Sr. as a gift for his wife, silent screen legend Mary Pickford. Pickford adored the ring and wore it extensively during her lifetime. Upon her death in 1979, she bequeathed the Star of Bombay to the Smithsonian Museum where the extraordinary specimen has been on display ever since. The Star of India, whose mysterious early life lends to its intrigue. In preparation for the Paris Exposition of 1900, wealthy financier J.P. Morgan commissioned gem expert George Kunz to acquire an impressive gem collection. The Star of India was one of the standout pieces that Kunz found, although its provenance prior to the Exposition is unknown. Discovered in Sri Lanka, the grey-blue star sapphire weighs in at 563.35 carats, is almost flawless and quite unusual in that it has stars on both sides. 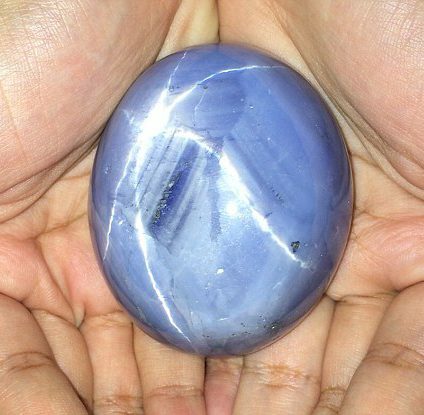 This was the largest blue star sapphire in the world until the discovery of the Star of Adam in 2016. After the Exposition, Morgan donated the Star of India as well as all the other gems to the American Museum of Natural History. The impressive Logan Sapphire, with beautiful clarity and cut. Weighing in at 422.99 carats, this gorgeous blue sapphire is the second largest faceted gem-quality blue sapphire in the world. Named after Mrs. Polly Logan, a Washington D.C. socialite who acquired the flawless Sri Lankan stone, it is cushion cut and has a rich deep blue color. 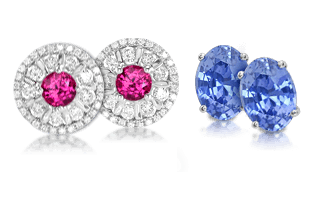 The Logan Sapphire is set in a brooch surrounded by 20 round diamonds, about the size of an egg. 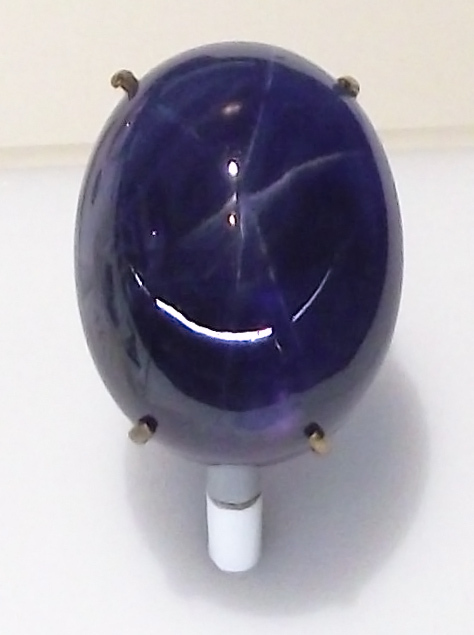 Mrs. Polly Logan donated the gemstone to the Smithsonian Institution in 1960, where it is currently on display alongside the Bismarck Sapphire Necklace. This 98.56 carat cornflower blue sapphire was mined in Burma and purchased in 1926 by American tycoon Harrison Williams for Countess Mona von Bismarck during their honeymoon. It is believed that the sapphire was much larger before it was recut by Cartier upon its placement in a necklace. The Bismarck Sapphire Necklace, set in an Art Deco mounting with additional sapphires. Photo credit: Smithsonian Museum. The Bismarck sapphire necklace is seen as being one of the most influential examples of Art Deco jewelry. The cushion-cut sapphire itself was set as a pendant with diamond and sapphire surround hanging from a single chain of platinum links separated by various cut diamonds. Bismarck herself was a wealthy American fashion icon, international socialite, and actress who featured the necklace in many paintings and social events. In 1967, Bismarck donated the necklace to the Smithsonian Institution where it has been on display ever since. The Maria Alexandrovna Sapphire Brooch with beautiful facets. 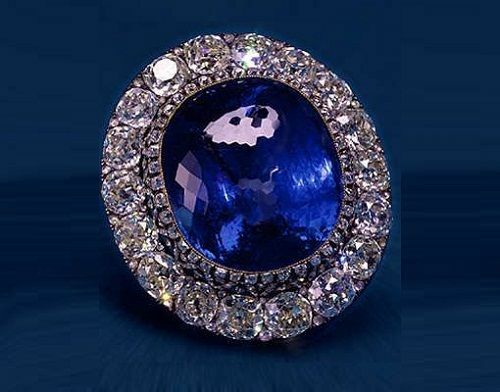 During the Great London Exhibition of 1862, Russian Emperor Alexander II purchased a sapphire weighing 260.37 planning to present the stone to his wife Empress Maria Alexandrovna. This quality of stone is rare and known for its combination of size, color, clarity and unusual cut. 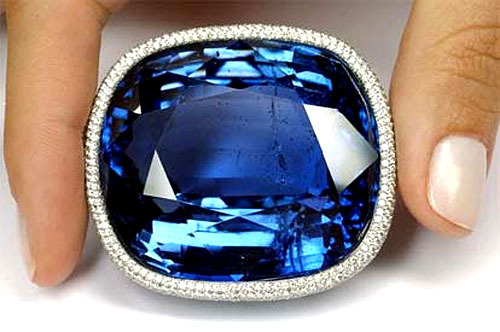 The stone has a very evenly distributed medium-dark saturated blue color, highly revered for Sri Lankan sapphires. 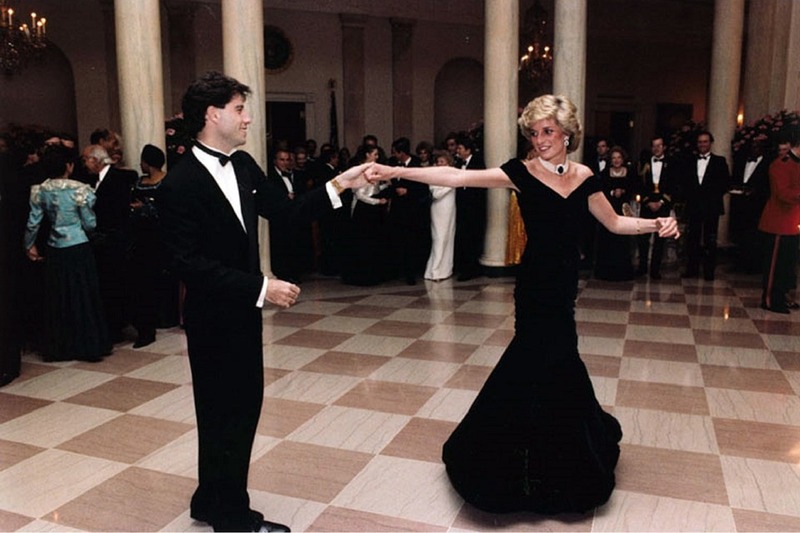 The stone was subsequently set in a brooch where it was surrounded with 56.60 carats of diamonds. This piece of history now resides in the Russian Diamond Fund. 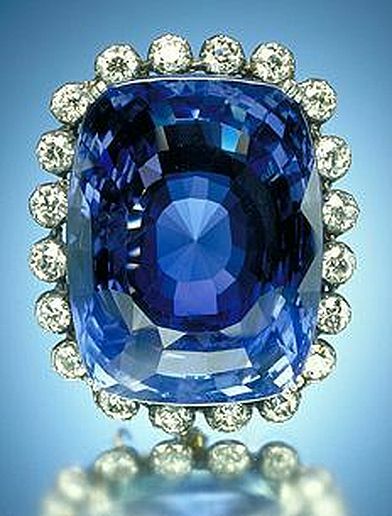 The Stuart Sapphire as it has been set in Queen Victoria’s State Crown. 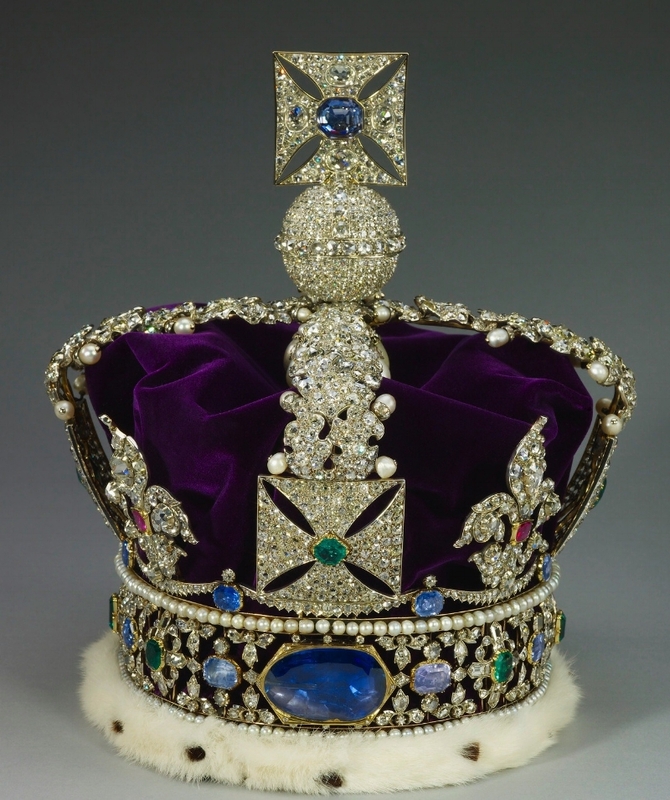 The stone was set into Queen Victoria’s State Crown, just below the Black Prince’s Ruby. In 1909, during the reign of King Edward VII, the sapphire was moved to the back of the crown to be replaced by the 317 carat Cullinan II diamond. 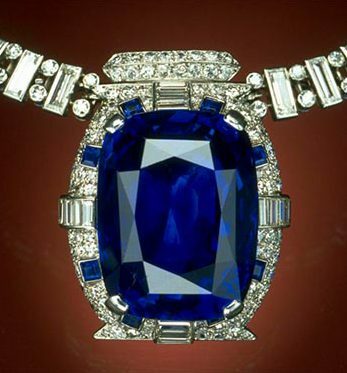 The Stuart Sapphire still occupies that position in the back of the crown as it is used today by Queen Elizabeth II. The stunningly cut Rockefeller Sapphire set in an impressive cocktail ring. The Rockefeller Sapphire is a 62.02 carat internally flawless cornflower blue sapphire. It acquired its name from the one time proprietor, John D. Rockefeller Jr. The only son of John D. Rockefeller Sr. purchased the stone in 1934, from an Indian Maharajah thought to have been the seventh and the last Nizam of Hyderabad, Mir Osman Ali Khan, whose period of rule extended from 1911 to 1948. This precious gemstone is presented in a perfect rectangular cut, mounted as a ring with diamonds flanking either side. It was set as a brooch by Rockefeller’s first wife and redesigned as a ring by his second wife who then sold it to a private collector in 1971. It has since been sold at auction multiple times, the most recent being in 2001 for just over $3 million. 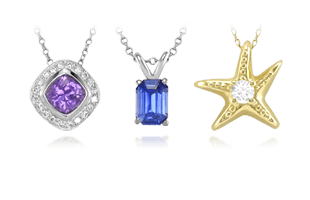 The Blue Giant of the Orient set in a pave-set diamond surround. As the largest faceted sapphire in the world, the Blue Giant of the Orient is a massive 486.52 carats and another legendary stone from the Ratnapura region of Sri Lanka. Discovered in 1907, the rough sapphire weighed in at more than 600 carats and was purchased by major exporter O.L.M. Macan Marker & Co. The cornflower blue gemstone was then cut and faceted into a cushion-cut stunner before being sold to an anonymous collector in the same year. For almost 100 years, the stone was out of the public eye and seemingly lost to history until appeared at a Christie’s auction in 2004. The sapphire appears with lovely even color saturation, is set in a platinum brooch with a pave-set diamond surround, and sold after auction for $1 million to an anonymous buyer once again. 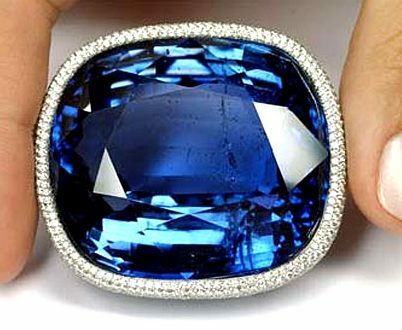 The Blue Belle of Asia stands out as one of the world’s most legendary sapphires and has earned the title as the most expensive blue sapphire sold at auction with the winning bid of almost $17.5 million in 2014. Now in the hands of an unidentified private collector, the mystique around this piece continues to grow. 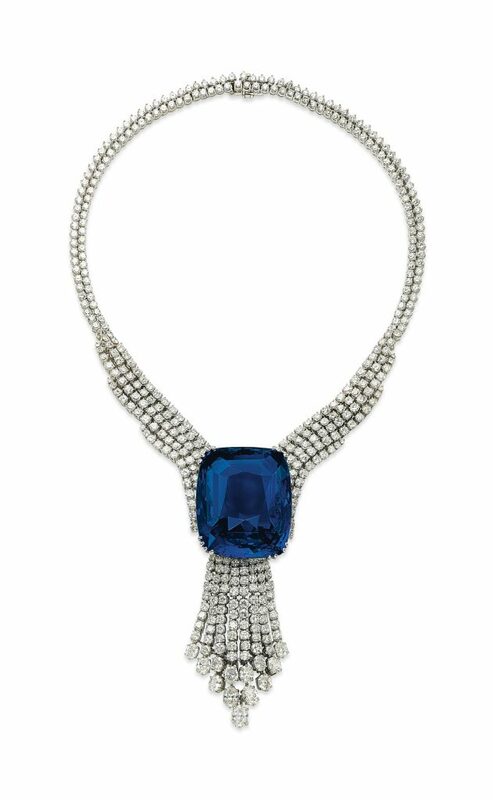 The massive Blue Belle of Asia, set in a stunning diamond necklace. Photo credit: Christie’s. The stunning stone weighs in at 392.52 carats of untreated cushion-cut Ceylon blue sapphire, suspended on a brilliant cut diamond tassel pendant and mounted on a multi-strand diamond and gold necklace. 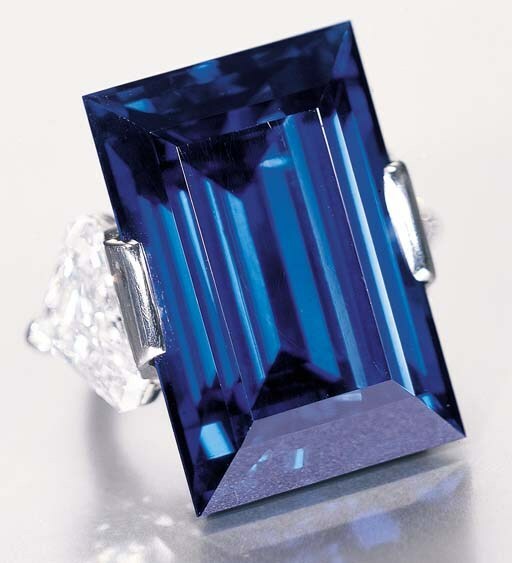 The sapphire was first discovered in 1926 in Ratnapura, the fabled “City of Gems” in Sri Lanka. It was quickly scooped up by a gem dealer who then sold it to Lord Nuffield of England. From there, the history gets a little muddy. It was believed that the intent of purchase was for a coronation gift for Queen Elizabeth, but it never appeared and fell into private hands for the next 35 years. It continued to change hands, surfacing for a bit in the 1970s, but disappearing again before coming up for sale at auction in 2014 from a large estate collection of a Saudi collector. 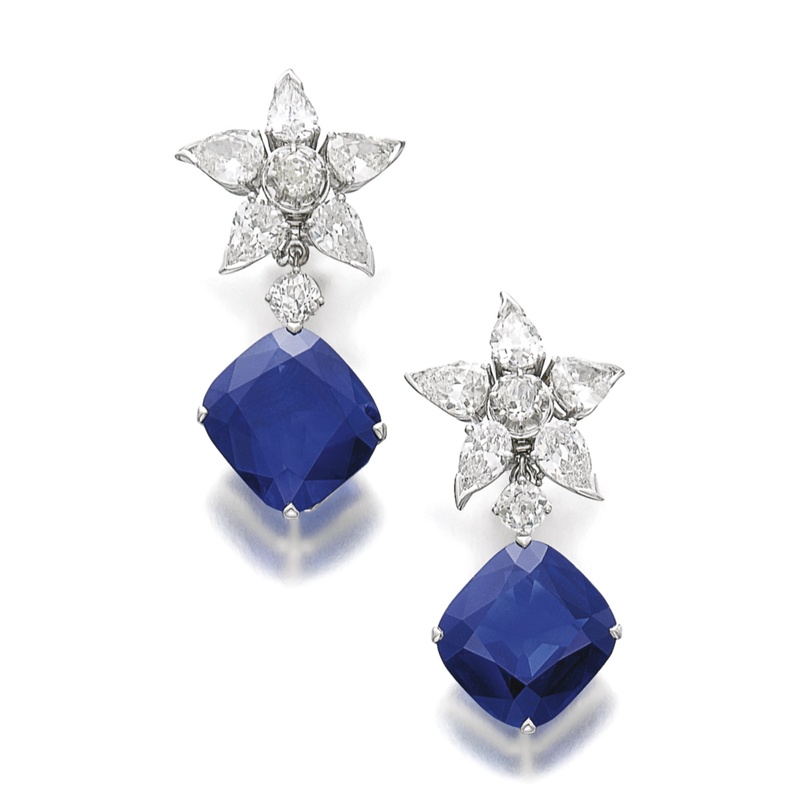 The Richelieu Sapphires set in classic diamond flower drop earrings. Photo credit: Sotheby’s. Some of the most gorgeous sapphire earrings to come to auction in recent memory, it is extremely rare to find such large blue sapphire stones, with excellent color and clarity, so perfectly matched. Each sapphire in this pair of earrings is an untreated Kashmir cushion-cut, weighing 26.66 and 20.88 carats, and suspended from a diamond-set star. These stunning sapphires were presented as a wedding gift to Odile de Richelieu on the occasion of her marriage to Count Gabriel de la Rochefoucauld in 1905. The sapphires have been reset twice into their current setting which sold at auction in 2013 for just almost $8.5 million. Of course, no listing of the world’s most famous sapphires would be complete without possibly the most famous piece of sapphire jewelry, Princess Diana’s sapphire and diamond engagement ring. 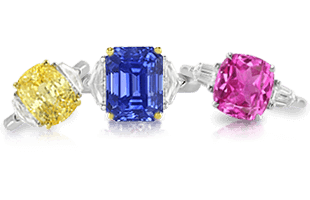 We cover that and more next in The Legacy of Princess Diana | Famous Royal Sapphire Engagement Rings.